A research team at Queen’s University Belfast in Northern Ireland has renewed a relationship with Aquamarine Power, a leading marine technology energy company. Together they may create the next generation of wave power converters that could some day be an alternative source of power for European maritime states. This five-year deal will focus on perfecting a so-called ‘Oyster’ wave power device which the university’s Wave Power Research Team and Aquamarine Power created between 2005 and 2008. Professor Trevor Whittaker, who leads the research team at Queen’s, says the next generation of Oyster would be the precursor to a commercially -viable model that could produce alternative power for much of the UK with its long coastline. 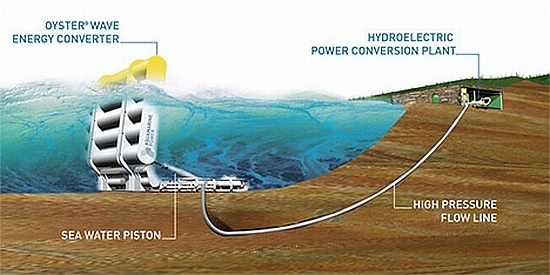 The Oyster device is designed to capture the energy found in near-shore waves, which is then sent to a seaside converter to be made into hydroelectric power. Whittaker said the deal would be indispensable for both partners. While Aquamarine Power would have the benefit of using some of the field”s leading experts and their research, the university would benefit from financial support and hands-on experience for its PhD students. Whittaker said the team from Aquamarine would rent the university’s state-of-the-art wave tanks to test several models, creating income for the university. Aquamarine also agreed to provide funding for two full-time staff members at the research facility: a senior research fellow, and a technician. The team will monitor survivability and watch how the devices interact with each other to guarantee continuous power output in all sea states. Whittaker said commercial wave power was still “in its infancy,” but Oyster Two, which would form the basis of any commercial model, would be ready by 2011. Its predecessor, Oyster One, will be launched at sea for testing this summer at the European Marine Energy Centre off the coast of north-east Scotland’s Orkney Isles. Dr Ronan Doherty, Aquamarine’s Chief Technical Officer, said the UK Carbon Trust had estimated that up to 20% of current UK electricity demand could be met by wave and tidal stream energy, with the majority being in coastal communities. “World leading facilities and researchers at Queen’s enable Aquamarine Power to not only peruse the industrial design of our products in a detailed way, but it is also the source of constant innovation and challenge resulting from their blue sky thinking and fundamental research,” Doherty said. Oyster device developed by Queen’s University seems very interesting for the follwed one of OWC. It is a type of a direct driven system which is easier to convert the energy efficiently than OWC. Since the wave is similar to the other waves used in the tel-comunication, the system should be governed by the resonation and impedance match principle. Thank you.